There is a conspiracy in Germany that Bielefeld does not exist. There are even Wikipedia entries about it. So, for any Germans reading this, it may surprise you to know that I have actually been there, eaten food and drank various soft beverages there and in fact was arrested in that veritable Bermuda Triangle of Germany. Apparently it started off as a Usenet joke which took on its own life. Made much worse some years later when Google Maps misaligned their satellite hybrid view, so that the street overview was placed on a blank forest area. Apparently the council of Bielefeld even went so far as to create an advertising campain with the slogan “Bielefeld gibt es doch!” (Bielefeld does exist!” and they still recieve calls and emails that doubt the very existence of the City. 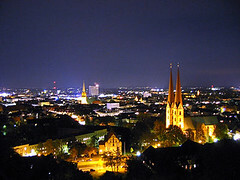 Do you know anyone that has ever been to Bielefeld? Based on this, it is my belief that the Flying Spaghetti Monster is based there and not, as people were led to believe, in Kansas. My personal memories of Bielefeld as a city are somewhat cloudy. I get glimpses of the place in sort of random 4 second snapshots…Almost as if my memory was wiped in an alien abduction/probe kind of way. That said, I do clearly remember being there with around 5 other guys, at about 8 in the morning on a Sunday. I don’t actually know why though, seeing as there a no shops open on a Sunday. I quite like that, even though I am not religious, you get Sundays as a proper day of rest…unless you work in a Bakery. Or a restaurant. Or a bar. Or cafe. Of course the Kiosks are open obviously. Other than that nothing is open. Oh, mustn’t forget the people that operate public transport. So other than bakeries, restaurants, cafes, bars, kiosks and public transport…everything is.. wait, swimming pools. And fitness centers. Almost forgot cinemas…oh and the souveneir shops. As you can see, they feel really strongly about making sure that the Germans get their day of rest…you can even get in trouble for washing your car! Anyway, back to Bielefeld…so myself and 5 others were wandering through Bielefeld playing Def Leppard at a reasonable volume (if we were deaf) when the police arrived and asked us very politely to turn it down arrested us. It might have been OK if we had simply turned it down when they turned up and spoke to them, instead of scattering like cockroaches when you turn the light on. Apparently, the police don’t like getting exercise that early in the morning…especially before they have had their morning doughnuts and coffee. Still…we got away with it and our parents were none the wiser. Actually, speaking of the German lads trying to pretend they were English.. A loooong time ago, I was heading to visit my folks in my battered Morris Marina when I remembered that I needed to get some cash out of the bank. I left work early and headed into Newark to do just this. I was in holiday mode and not really concentrating too much…so much so that I just followed the traffic into the Market Square. I pulled up outside the bank and nipped inside. I left the keys in the car as it was impossible to start without knowing how. I got to the cashiers desk and was waiting for my money when I heard the distinctive sound of my car trying to start. A quick glance out of the door and I suddenly notice the world. A world in which the Market Square is full of Market traders…on Market day no less. I had followed market traders onto the market square and had parked in just the right position to stop any of them moving their vans around to pack up and leave. This entry was posted in Back In Time, Stuff and tagged faux pas, germany, honesty by Dave. Bookmark the permalink.